John has already taught in this letter that we should love one another (3:11–24). In today’s passage he develops this further. Four times he uses the expression “love one another” (7,11,12,21), and he uses the word “love” a total of 27 times in these 15 verses. On the surface it seems he’s just repeating himself. But actually John is developing how essential love is in being a real Christian, and along the way he addresses the honest struggles we all may have with both accepting and practicing God’s love. As some of us may have experienced, loving people sounds good, but it may be the hardest thing in the world to really do. It’s easy to be superficially nice, but hard, once we get to know people with all their flaws and weaknesses, to really love them. John speaks to this by saying that real love starts with God himself. In these verses we learn what God’s love is like. We learn what happens when we actually accept God’s love personally. And we want to learn what it means to “live in” God’s love, and how and why we should do so. May God speak to us through his living word today. Read verses 7–8. Here John not only teaches that we should love one another but also explains why. We should love one another not merely to be good people, or to feel good about ourselves, but more than that, John says, because love comes from God. In fact, John makes a radical statement, found only in this passage in the entire Bible. He says, “God is love” [emphasis added] (8,16). There are many things to know about God. God is Spirit, he’s light, he’s invisible, wise, eternal, righteous and just, faithful, holy, and ultimately, beyond our understanding. But at his core, in his essence, John says, God is love. In his prayer just before his death, Jesus said that the Father “loved” him “before the creation of the world” (Jn17:24). God in his essential nature has always loved. Even before he made the universe, God existed in three persons, Father, Son and Spirit, and these three Persons of God related to one another in love. In this love, the Three are the One, in perfect unity. These three Persons of God having beautiful love relationships with each other show us that God is love. Based on this core truth about God, John says that if we’re truly connected to God, if we really have a relationship with him, if we’re born of God and are his children, then it only follows logically that we should love, too. As his children, we should be like our Father God, who is love. C.S. Lewis said, “The Son of God became a man to enable men to become sons of God.” But are we really sons and daughters of God? Some people may know a lot about God. They may be very knowledgeable about the Bible, and morally and ethically strict. But in them if there’s not any resemblance of God who is love, it probably means they don’t really know God. That’s a sobering thought. If our lives are characterized mainly by conflicts, indifference or no close relationships with others, we need to reexamine if we actually have a relationship with God. While he’s on the subject that God is love, John seems aware that some people won’t easily agree with that statement. People can have a hard time believing God loves because they’ve experienced so much suffering. They ask, “If God loves so much, why would he allow such horrible things to happen?” Read verse 9. For John, the overwhelming proof that God is love is that God sent his one and only Son into the world that we might live through him. Often we can’t understand our sufferings or others’ sufferings in the world. But when we know God who is love, we know that in all things God works for the good of those who love him (Ro8:28). God’s love is more than a feeling; it’s an undeniable, historical fact. In his Gospel John wrote one of the most famous Bible verses: “For God so loved the world that he gave his one and only Son, that whoever believes in him shall not perish but have eternal life” (Jn3:16). It may sound very familiar and simple, but actually nobody ever graduates from needing to think about it. We should pray for ourselves and others to be rooted and established in God’s love and to grasp the greatness of his love more and more (Eph3:16–19). In fact, John says, Jesus’ coming, this act of God, is the very definition of love. Read verse 10. Here John goes even deeper into the nature of God’s love. He wants us to take a few moments to reflect on what God’s love is really like. First of all, God loved us when we did not love him. We need to capture how amazing that is. Later in verse 19 he says that God loved us first. Paul described this love so well in Romans 5:8: “But God demonstrates his own love for us in this: While we were still sinners, Christ died for us.” Even when we were rebelling against him, God loved us so much that he gave his one and only Son for us. It’s a love that always takes the initiative even when it’s not reciprocated, a love that always gives, a love that never calculates, a love that’s always undeserved. Jesus showed this love to his disciples at the Last Supper. He knew that even though they thought they did, they didn’t really love him; they all were about to abandon him when he needed them most. Still, he humbled himself and one by one he washed their feet (Jn13). God’s love is far greater than our human love. We humans naturally tend to love our own immediate family members. Sometimes we may even love those who’ve been good to us. But God so loved us even when we were his enemies (Ro5:10). He gave us the best love he could give. It wasn’t a love that spoils us or glosses over all our problems; his love was so deep that it actually addresses our core problem of sin and provides a real solution. Later John describes it as “complete” love or “perfect” love (12,18). Some people think they’ve always loved God. They don’t know themselves or God very well. Let’s read verse 10 again. This verse tells us that we can receive God’s great love when we’re humble enough to admit that we’re only sinners. This is what Peter finally experienced after he boasted that he would die for Jesus, then denied him three times, and three times Jesus asked him, “Do you love me?” (Jn21:15–17) When we accept how much God loved us first, when we didn’t love him at all, then love for God truly begins in us. So what should we do with this love? Just enjoy it for ourselves? Read verse 11. Since we’ve been shown such a great, undeserved love, it’s only right that we in turn should love. Otherwise, we become like the man in the parable of the unmerciful servant. He had his own huge debt cancelled, but was squeezing a fellow servant for just a few dollars more (Mt18:21–35). The point wasn’t money but willingness to show forgiving love to a brother or sister. Some people expect Christians to be perfect; if they’re not, they label them as useless hypocrites. But Christians are weak sinners just like everybody else. As we live in fellowship with each other, sooner or later it’s inevitable that we’ll sin against each other in some way. In fact, we sin against each other again and again. When someone sins against us, we can’t help but get hurt. But when we’ve received God’s great love, instead of harboring hurt feelings, we should forgive from our hearts, again and again, and love the way God loves. John has already taught us that to love in this way, we should “lay down our lives for our brothers and sisters” (3:16). We should love one another not with words or speech but with actions and in truth (3:18). As God’s children we’re expected to practice his great love. But actually doing it is never just ordinary. It’s always striking, moving and noteworthy. It’s because it’s so different from usual human behavior. It’s a glimpse into the reality of God himself. Read verse 12. As believers show God’s love for each another, people observing them get to see not a theoretical teaching but the reality of God himself, and living evidence of his love. Jesus told his disciples when he gave them the command to love one another: “By this everyone will know that you are my disciples, if you love one another” (Jn13:35). God really wants his love to be “made complete in us,” meaning that it becomes evident in real life relationships. People in general can’t see God, but when they see Christians, it’s their chance to see the reality of God’s love in action. But if all people can see among Christians is superficiality and judgmental-ism, they can’t really see God. How wrong that is! Yet how often that’s what’s really happening! How often people in churches are so cruel to each other and fight over silly things! How much we need to repent! God’s love needs to be made complete “in us,” meaning among us. It needs to be real. How can God’s love be made complete or real in and among us? Read verse 13. The key is to have a real, personal connection with God. He lives in us, and we live in him. Jesus described it as having a vine and branch relationship with him (Jn15). It’s possible, John says here, because God “has given us of his Spirit.” The Spirit dwelling within us makes our relationship with God not an abstract theory but a real-life experience. Through the Holy Spirit God’s love is poured out into our hearts (Ro5:5). Then we can really begin loving one another in the same way God loves us. John says the Spirit also leads us to tell others about Jesus. Read verses 14,15. So far, the expression “God lives in us” has been repeated in verses 12 and 13, and now we see it again in verse 15. Why does John repeat this? Partly it’s to give us discernment about people. When we witness people showing others God’s love, we can trust them because it’s evidence that God is living in them. But if we encounter people incapable of ever showing God’s love, we have to question the reality of their relationship with God, no matter how much they seem to know or how well they speak. We also find in verses 14,15 how an intimate relationship with God begins. John says it’s when we “acknowledge that Jesus is the Son of God.” When we acknowledge that Jesus is the Son of God, John says God lives in us, and we in God. But what does it mean to acknowledge that Jesus is the Son of God? It’s way more than just head knowledge. It means to make a confession of faith. It means to accept the testimony of those who were with Jesus and that’s recorded in the Bible. In verse 2 John said that we should acknowledge that Jesus came in the flesh, meaning that he was fully human. Here in verse 15 he says we should acknowledge that Jesus is the Son of God, meaning that he is also divine. When we really come to know Jesus, who was fully human and fully God, God lives in us, and we live in him. That’s why Jesus is the way and the truth and the life (Jn14:6). Only through Jesus can we have a real relationship with God. It’s not mere knowledge but a way of living. How does this relationship affect us? Let’s read verse 16a. When we have a living relationship with God through Jesus, we know and rely on the love God has for us. But why does John say this here? It seems to be because we can’t have confidence in ourselves to love. When we think about God who is love and how he loved us, we can feel so inadequate. In light of the greatness of his love, we can see how much we fall short, how limited we are, how feeble our love is, and frankly, how much we fail to really love. But this doesn’t leave us just feeling condemned. Instead, it brings us back to appreciating his great love for us personally, even though we’re so imperfect. It also helps us rely not on ourselves but on the love he has for us. Some of us may have tried to love and have just gotten burned out; we just don’t have it in us anymore to love. But when we stop relying on ourselves and rely only on his love we can go beyond ourselves; we can actually start loving the way God does. Knowing and relying on God’s love are at the heart of real Christian living. When we know and rely on his love, it always changes the way we relate to people. If our hearts are tired or sore and we just don’t want to do it anymore, may God help us to know and rely on the love he has for us, and in his love may he inspire us to make a new decision to love again. Let’s read verse 16b. This is an imperative statement for anyone who claims to know God or have a relationship with him. 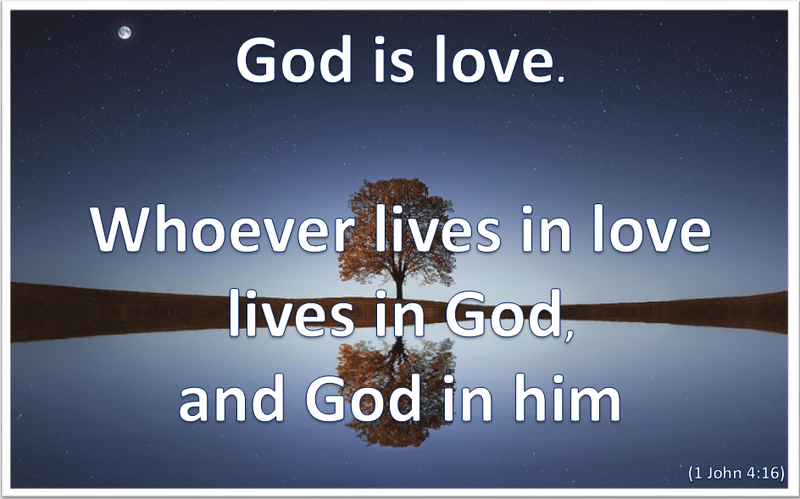 Since God is love, having an ongoing, living relationship with him means living in love. Living in love means practicing God’s divine love toward all the people around us. Many Christians are in fact living in legalism, not in love. They’re focused on keeping many rules and rituals, on doing all kinds of church activities and works, and getting others to do so. When others don’t do the work and don’t keep the rules and rituals, they’re no longer interested in them. That’s not living in love. Living in love means practicing the essence of God’s love on an ongoing basis, always taking the initiative, always giving, never calculating, and always showing love to people who don’t deserve it. Living this way shows that we’re really living in God, and God is really living in us, because there’s no other way we could humanly do it. Then John makes an amazing statement. Read verse 17. How amazing that as we live in God’s love, in this world even sinners like us become like Jesus! That’s truly amazing grace. Read verse 18. Living in love helps us to be ready for the day of judgment without any fear, guilt or regrets. John reminds us again of how even mature Christians can possibly love others. Read verse 19. All the credit for our loving others the way God does goes not to us, but to God who first loved us. Only because he first loved us could we ever truly love. John concludes by stressing how crucial it is for us to learn how to love our brothers and sisters. Read verse 20. At first it may seem extreme to say that we “hate” a brother or sister. But if we’re indifferent, that’s hatred. If we’re holding grudges, that’s hatred. Someone once said, “God I love; it’s people I can’t stand!” But John says such a person is a liar. The truth of our love for God is measured by how truly we love the real-life, flesh-and-blood, work-in-progress Christian brothers and sisters around us. This is another call to repentance. Read verse 21. It’s a command probably because most of the time, we’re not going to feel like doing it. But we should do it out of our love for God. Let’s read verse 16 again. Today we thought about the greatness of God’s love, and how we can live in an intimate relationship with him that enables us to love the way he does. May God renew our hearts in his great love, and help us know and rely on his love so that we can live in love.